This Map will Help You Understand More about Culture of the Countries! Cultures are complicated, and anyone attempting to explain or group them will struggle to avoid giving offense. Political scientists Ronald Inglehart of the University of Michigan and Christian Welzel of Luephana University in Germany put forth their best effort by analyzing data and plotting countries on a “culture map.” Their system stems from the World Values Survey (WVS), the largest “non-commercial, cross-national, time series investigation of human beliefs and values ever executed,” which dates to 1981 and includes nearly 400,000 respondents from 100 countries. The latest chart, published several years ago, includes data from surveys conducted from 1995 to 1999, 2000 to 2004, and 2005 to 2009. So what’s going on in this chart? On the y-axis, traditional values emphasize the importance of religion, parent-child relationships, and authority, according to WVS. People who embrace these tend to reject divorce, abortion, euthanasia, and suicide. These societies usually exhibit high levels of nationalism and national pride, too. In the U.S., these values would likely align more with conservative ideologies. Oppositely, secular-rational values represent the other extreme and tend to relate to liberal ways of thinking. On the x-axis, survival values revere economic and physical security and safety and are linked to low levels of trust and tolerance. On the other side, self-expression values give high priority to protecting the environment, promoting gender equality, and tolerating foreigners and gays and lesbians. 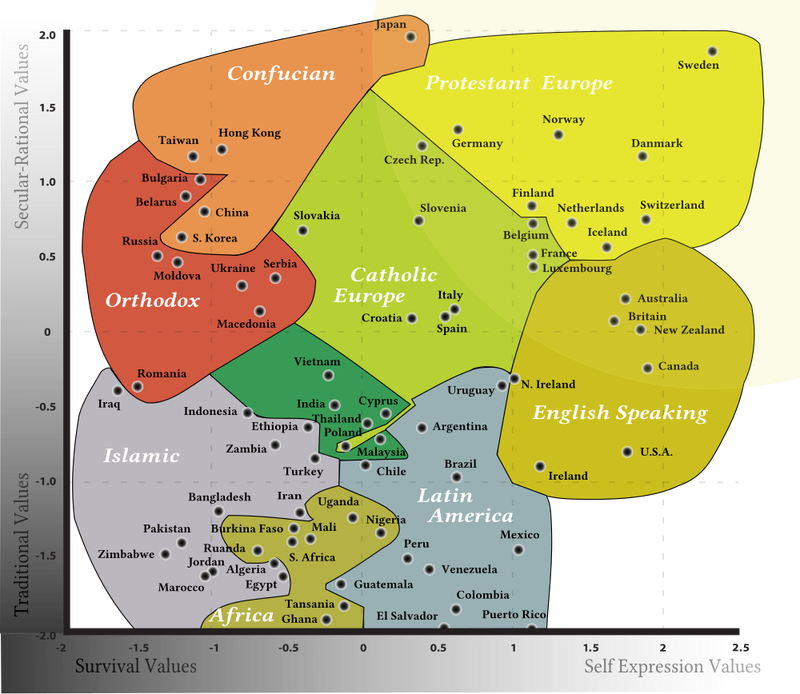 The chart also groups nearby countries with shared characteristics such as “Islamic” or “English Speaking,” showing how much things like language and religion shape culture. A somewhat simplified analysis is that following an increase in standards of living, and a transit from development country via industrialization to post-industrial knowledge society, a country tends to move diagonally in the direction from lower-left corner (poor) to upper-right corner (rich), indicating a transit in both dimensions. However, the attitudes among the population are also highly correlated with the philosophical, political and religious ideas that have been dominating in the country. Secular-rational values and materialism were formulated by philosophers and the left-wing politics side in the French revolution, and can consequently be observed especially in countries with a long history of social democratic or socialistic policy, and in countries where a large portion of the population have studied philosophy and science at universities. Survival values are characteristic for eastern-world countries and self-expression values for western-world countries. In a liberal post-industrial economy, an increasing share of the population has grown up taking survival and freedom of thought for granted, resulting in that self-expression is highly valued. For example, Morocco, Jordan, and Bangladesh (all Islamic countries) score high in traditional and survival values, while the U.S., Canada, and Ireland (all English-speaking countries) score high in traditional and self-expression values. Russia, Bulgaria, Ukraine, and Moldova (all Orthodox countries) score high in secular-rational and survival values, while Sweden, Denmark, and Switzerland (all protestant Europe countries) score high in secular-rational and self-expression values. In their 2005 book “Modernization, Cultural Change, and Democracy,” Inglehart and Welzel argue that “socioeconomic development tends to bring predictable changes in people’s worldviews.” Notably, these developments tend to democratize countries, and modernization — “a syndrome of social changes linked to industrialization,” as the duo define in a 2005 Foreign Policy article — kick-starts the process. For example, Inglehart and Welzel link industrialization with a move from traditional to secular-rational values, leading to separation of religion and authority. Next the post-industrial phase of modernization produces a shift from survival to self-expression values, which brings greater freedom from authority. But cultural and historical traditions, like Protestantism or communism, matter, too. They “reflect an interaction between driving forces of modernization and the retarding influence of tradition,” Inglehart and Welzel write in their book. WVS is currently preparing data from wave six with surveys conducted from 2010 to 2014. Another attempt to explain world cultures, the Lewis Model based on observations from linguist Richard Lewis, charts countries in terms of “reactive,” “linear-active,” and “multi-active” tendencies. Next story Check it Out: What to Do during Traveling?